The route leads mostly through the Gauja National Park where you will see the most beautiful river valley in the Baltic States. It is the ancient Gauja River valley with gorgeous flora and fauna and the mightiest Devonian-period sandstone cliffs, in the region. While riding the route, you can study Latvia's most brilliant medieval city, Cēsis. You can visit medieval castles and castle ruins there and in Sigulda. A guide will take through underground bunkers in Līgatne which were secret in soviet times and have no analogue in North-eastern Europe. You will then pass through the beautiful Otepaa highlands and the Lahemaa National Park in Estonia. The old town of Tallinn is on the UNESCO list of world cultural heritage. Pick up the info package with maps and a detailed itinerary description at the hotel reception. Breakfast. Pick up the bicycles in hotel. Cycling: Sigulda - Turaida – Sigulda - Līgatne (~33km, 60% asphalt, 40% gravel road). En route, visit the Turaida museum reserve with the ruins of a Livonian Order castle. There is an observation tower and a sculpture garden on the banks of the Gauja. Also do some sightseeing in Sigulda. In the evening, you can walk or bike through the Līgatne Nature Park, where fauna from the Baltic region can be observed in special enclosures. Overnight in guest house in Līgatne. Cycling: Līgatne – Āraiši – Cēsis (~35-45 km, 60% asphalt, 40% gravel road). The road leads through the Gauja National park, where one can see various sandstone cliffs and caves on the banks of the Gauja River. Sightseeing at the ancient water castle and the windmill in Āraiši. The castle was built in accordance with evidence from archaeological excavations, and it demonstrates the way in which people lived thousands of years ago. Sightseeing of the town of Cēsis with its Livonian Order castle ruins and the Medieval Old Town. Overnight in guest house in Cēsis. Cycling: Cēsis – Valmiera (~50km, 24% asphalt, 76% gravel and forest road). En Further, the route leads through forests and meadows in the ancient valley of the Gauja River, with various sandstone cliffs and caves. Sighsteeing of the town in Valmiera. Overnight in hotel in Valmiera. In the early morning take the train: Valmiera – Lugaži (43 km, ~1.40 LVL per person, ~0.70 LVL per bicycle, ~1h). Cycling: Lugaži – Valka (Latvia) – Valga (Estonia) (~7 km). En route sighsteeing of the twin-towns Valka and Valga. Cycling: Valga – surroundings of Otepää (~45km, 100% asphalt). The route leads through the uplands of Otepää with wonderful nature landscapes. Overnight in guest house in surroundings of Otepää. Cycling: Otepää – Põlva (~53 km, 100% asphalt). The route leads through the nature park of Otepää. En route, sightseeing at the town of Põlva. Overnight in hotel in Põlva. Canoeing on the river Ahja (~7km, 2h). During the canoeing tour one can see beautiful sandstone cliffs, wild nature and birds and animals. Lunch break with hot soup. Cycling: Ahja – Tartu (~ 40 km, 100% Asphalt). Free time in Tartu, Estonia’s second city. Sightseeing in the Old Town, which was built up in the style of Classicism. Visit Tartu University – the oldest in the Baltic States – as well as the old observatory. Overnight in guest house in Tartu. Take the train: Tartu – Tamsalu (130 km, ~80.00 EEK per person, ~40.00 EEK per bicycle). Sightseeing at the ruins of the old Livonian Order castle and the Old Town in Rakvere. Overnight in guest house in Rakvere. Cycling: Rakvere – Vihula/ Altja (~30 - 40 km, 100% asphalt). Sightseeing of the Vihula manor. Overnight in Vihula Manor hotel or in a guesthouse in Altja. Cycling: Vihula/ Altja – Võsu – Vihasoo - Loksa (~50-40 km, 95% asphalt). 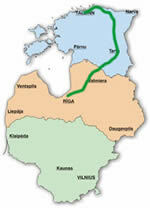 The route leads through the oldest Baltic national park, Lahemaa, which is located on the northern coast of Estonia. Huge boulders at the seaside, various nature trails, authentic fishermen’s villages and beautiful manor houses in Sagadi and Palmse are typical of the park. Overnight in guest house in Loksa. Cycling: Loksa – Kahala – Kiiu – Jägala Joa – Maardu - Tallinn (~70km, 85% asphalt, 14% gravel road). In the evening give back the bicycles in hotel. Overnight in a hotel in Tallinn, close to the centre of Tallinn. Sightseeing of the medieval Old Town Tallinn, the port district and the ethnographic open-air museum is reccommendable.